Scholarships & financial aid: Nearly 99% of undergraduates in the College of Arts and Sciences receive financial aid. Merit- and need-based awards are given. Pacific University is a fully accredited private university in the Pacific Northwest. Students from all over the world come to Pacific University for a personal, nurturing learning environment. Professors are dedicated teachers and mentors who spend time getting to know students, and Pacific is a place where diverse viewpoints are celebrated. Undergraduates choose from more than 60 fields of study that cross the spectrum. Pacific is especially known for its health and helping fields, with majors such as Social Work and Public Health, as well as Pre-med tracks. A Pacific education reaches outside the classroom. Student research, internships, international study, and community service are important parts of the Pacific experience. Inspired by our mascot, Boxer—an ancient Chinese statue that appears to be part dog, part dragon—Pacific University students embrace a spirit of diversity, inclusion, service, and fun. 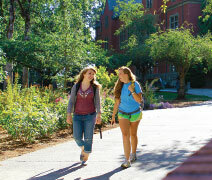 Students enjoy the close community that comes from a small residential campus. More than 60 student interest groups offer activities related to student media, academic societies, religious and political organizations, and service clubs, as well as an active Greek system. Pacific University participates in NCAA Division III Northwest Conference athletics, with varsity, junior varsity, intramural, and club sports. Students make the most of adventures in the Pacific Northwest outdoors, whether at the beach or Mount Hood, both just an hour from campus. A Pacific University education is grounded in a liberal arts and sciences foundation that prepares students for the path ahead. 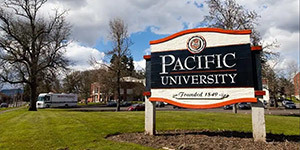 In addition to its robust undergraduate offerings, Pacific University is home to graduate and professional programs in Business, Education, Healthcare, Optometry, Social Work, and Writing. Many Pacific students go on to graduate school at Pacific or around the world. Pacific alumni live and work around the globe as leaders in almost every profession.